Voorhees, New Jersey – Leddy Naudain, owner and administrator of the Naudain Academy, now in it’s 35th school year, has always been one step ahead of how to change children’s lives. Her daughter Lauren follows in her footsteps as a co-administator who thinks outside the box. So it was no surprise that the Naudain Academy, where peace education has been a mainstay for students for many years, decided to introduce the YOUNG MASTERS LITTLE WISDOM DISCOVERY PROGRAM to it’s extended Day (Kindergarten) students. What is a Young Master? Read on and find out about this incredible program that teaches core values and life skills to children 4-8. Stephanie Pelly who teaches this self-discovery program in the New Jersey area, conducted the first of thirteen classes this week, by asking the children what they thought a Young Master was. “Someone who shares, a person who is peaceful, someone who does karate or ballet, a person who is loving and someone who helps others,” were some of the answers. One little girl asked, “Are you going to teach us how to care for ourselves and others?” “All great answers”, Stephanie commented and then went on to explain.”We’re all born with special gifts that we can share with others, “said Stephanie, “these gifts are not necessarily presents that you give to people that you buy from a store, but rather gifts that you can share from your heart – they’re the secrets of the heart. A Young Master is you!,” she said, “learning how to use those gifts.” The children were fascinated. 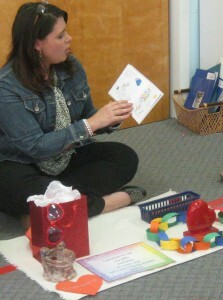 During the 13 week program, that spreads across the 2011-2012 school year, they will discover six different Secrets of the Heart. There is one book, chocked full with music and story for each secret. Stephanie asked the students if they would like to discover the first Secret of the Heart. With great enthusiasm they all screamed YES and from her little red treasure bag, she pulled out our first secret – FRIENDSHIP! The children were very excited. Before they read the story, she shared the Young Masters Pledge with them and they repeated after her , “I promise to use my gifts every day, in every way, for I am a Young Master!” This group of 24 students were fast learners and proudly said the pledge a second time holding up their peace fingers as they spun around smiling and standing proud. 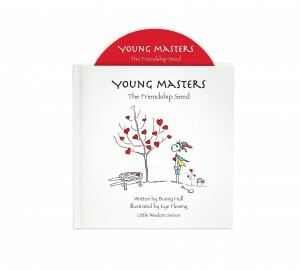 Stephanie then introduced the first book in the series YOUNG MASTERS – The Friendship Seed. She explained how Bunny Hull, the author used her imagination to create characters like Buttan, EEtha and Phlyos for the stories. The children listened carefully to the words of the story and learned that a smile is like a “friendship seed” they can share with anyone, anytime. 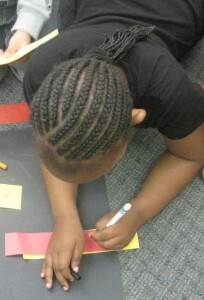 They talked about how friendship grows when you share a smile or kind words with a friend. 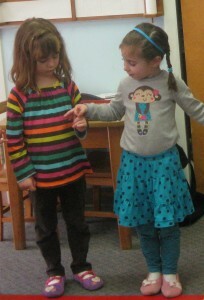 One child said, “You can plant a Friendship Seed when you ask a friend to play with you.” “So right,” said Stephanie. They talked about how they’re all connected. They took turns saying “I am a good friend because… ” and they each shared their own unique answer. Some children stood up and said, “because I respect others, because I am helpful, because I share.” They giggled as they talked about caring for their friends, making others laugh and being kind. Concepts of friendship were taking root. They created a friendship chain together where each child took two pieces of colored paper cut in strips and wrote their name and what makes them a good friend. They connected their chain of answers, words like helpful, kind, share and play together. Their understanding was growing. 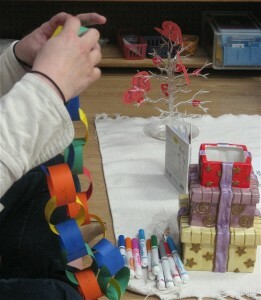 At the end they talked about how the friendship chain has many different colors. The colors can represent the differences in friends like, the different likes we may have or different talents. It was clear the children liked this idea. Their friendship chain will hang on their holiday tree for the next month. 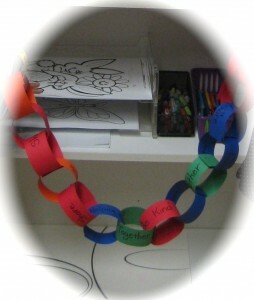 They were encouraged to create a friendship chain at home with their families. A deep exploration of friendship for children, designed to teach them that they are each Young Masters with many gifts to share…the secrets of the heart. This is no doubt a highlight for the children at Naudain Academy. They closed with the Young Masters Pledge. Next workshop the children receive their YOUNG MASTERS JOURNALS to chart the course of their discovery. Stay tuned. Visit Naudain Academy and find out how their making a difference in children’s lives.